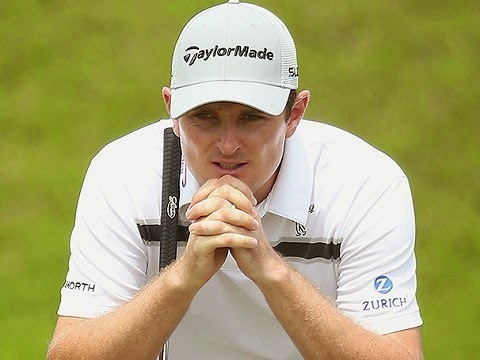 The team of PGA Tour Rules officials at TPC Sawgrass narrowly avoided bringing the Rules of Golf into disrepute late on Saturday evening, when they correctly reversed their earlier, perplexing ruling that had imposed a two strokes penalty on Justin Rose. I did not see the incident, but it seems that after Justin had addressed his ball on the last hole of his third round, he saw it oscillate, or move, and called over his fellow competitor, Sergio Garcia, to explain what had happened, but that in his view the ball had not moved from its spot. I understand that they then both watched a replay of the incident on a nearby video screen and concluded that there had been no breach. At the time of writing there is a short video clip of Rose addressing the ball at this link. In my opinion, this clip supports Rose’s contention that from where he was standing, over the ball, it did not move from its spot. However, after more than 30 minutes reviewing the incident on multiple broadcast feeds in three different trucks, including one feed where the ball was magnified x 50 (can you believe it? ), the officials came to the conclusion that the ball had indeed moved, and they imposed a penalty of one stroke on Rose, under Rule 18-2b, which increased to a penalty of two strokes, because he had not replaced the ball; where it was before it was deemed to have moved (Rule 20-7c). Why, prior to this ruling being made, none of the officials realised that Decision 18/4 was directly relevant to the incident is beyond me. This new Decision provides that, where enhanced technological evidence (e.g. HDTV, digital recording or online visual media, etc.) shows that a ball has left its position and come to rest in another location, the ball will not be deemed to have moved if that movement was not reasonably discernible to the naked eye at the time. This was obviously the case and happily, after USGA and R&A experts had been involved, it was agreed that the penalty had been wrongly imposed and it was rescinded. A detailed explanation from the PGA Tour, with the full wording of Decision 18/4, can be read at this link. Q. In addressing the ball, a player accidentally causes the ball to oscillate, but it returns to its original position. Has the ball "moved"? Common sense eventually prevailed at THE PLAYERS Championship in TPC Sawgrass. Let us hope that penalties will never again be imposed for a movement of a ball that is not reasonably discernible to the naked eye. I totally agree. Justin handled the situation very well, both following the imposition of the penalty and when it was rescinded. How is it possible to replace a ball if your not even sure it has moved in the first place. When rules officials are talking about a millimeter it would be very difficult, especially on longer turf, to get the ball to sit on the exact spot it "moved" from. I understand the point that you are making, but if a ball moves, it moves. The player must try and replace it where it moved from, even if it is only millimetres away. The Rules would be even more confusing and difficult to enforce if there was any attempt to include a distance that a ball could move without being replaced. If you hit the ball when it is oscillating is it a penalty. Is it the same rule for both on/off the green. There is no penalty if you hit your ball while it is oscillating (see Definition of Moved above). However, if a ball starts to move after the player has started his backswing they incur a penalty of one stroke under Rule 18-2b and the ball must be played from where it comes to rest following the stroke. There is an exception in that if it is known or virtually certain that the player did not cause his ball to move, Rule 18-2b does not apply. Barry, enjoy your website and emails, many tks. When you replace a marked ball on the green, and it subsequently moves prior to you addressing the ball, my understanding is that the ball is in play and should be played from where it comes to rest. My 2 partners assured me it must be replaced in its original position prior to my putt. You are correct, providing the player did not cause their ball to move. My blog of Monday, 6 April 2009 goes into more detail. I had a situation similar but not the same as that of D18/2 cited in the blog. The ball lay off the fairway on uneven ground, with a clump of vegetation just behind the ball on the line of the backswing. On commencing the backswing my club got caught in the clump and I stopped the swing and sought to move the club back behind the ball. However, the club nudged the ball gently and the ball moved slightly forward but returned to the spot it started from (it was in a small depression.) I concluded that I had not caused the ball to move, so no penalty. Do you agree Barry? If the ball had not returned to the spot, then it would have been a one shot penalty with the ball to be replaced - correct? Yes, I agree. If the ball definitely returned to its original spot then no penalty was incurred. If the ball moved off its original spot, even by a dimple, the penalty is one stroke and the ball must be replaced. In Justin's case, the official deemed Justin did not cause the ball to move and told him to putt it where it stopped. If it had been determined Justin caused the ball to move, he would have been assessed a one shot penalty and told to return his ball to its original position, correct? If that is the case, how could the USGA assess a post round penalty when the ball was not returned to its original spot? I hope to be writing in more detail on this incident later today (21st June 2016), including the explanatory statement from the USGA. In my opinion, the official was given wrong information by Justin, which meant thet his ruling had to be re-visited. He questioned, "You didn't ground your club?" Justin replied, "No", which was quite obviously wrong when you review the evidence. You are incorrect in saying, "the official deemed Justin did not cause the ball to move", he was only ruling with the evidence provided to him.